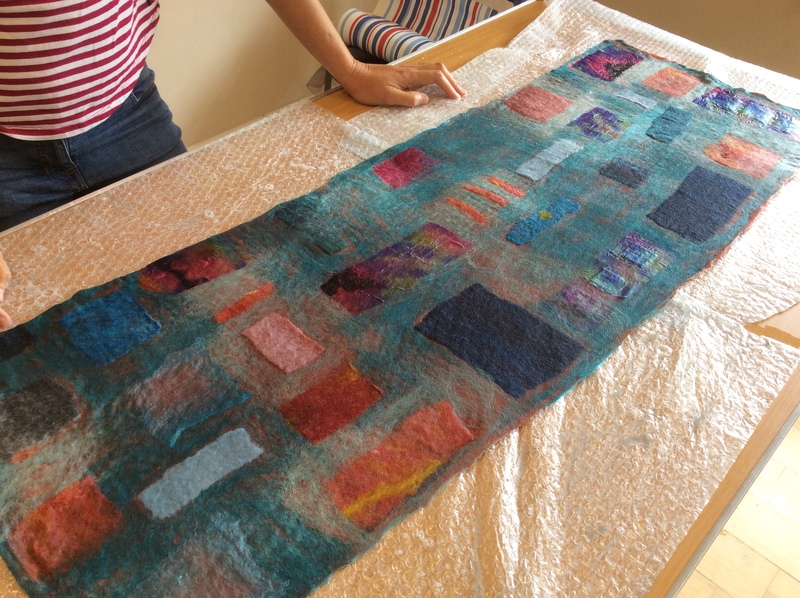 I am thrilled to announce that I will be offering two wet felting workshops in France this coming July. The workshops will be held at Sweet Nothings Art and Crafts Retreat in the beautiful Charent region. The retreat is owned and run by husband and wife team Natalie and Lawrence, originally from the UK, and you can read how they came to be running a business in rural France by clicking here. During your six day retreat you will have three workshop days and, with a maximum number of six students per class, there will be lots of opportunity for one to one time. A small class also allows for lots of flexibility so we can tailor your project to suit your specific wishes/needs rather than all having to work on the same design or template. 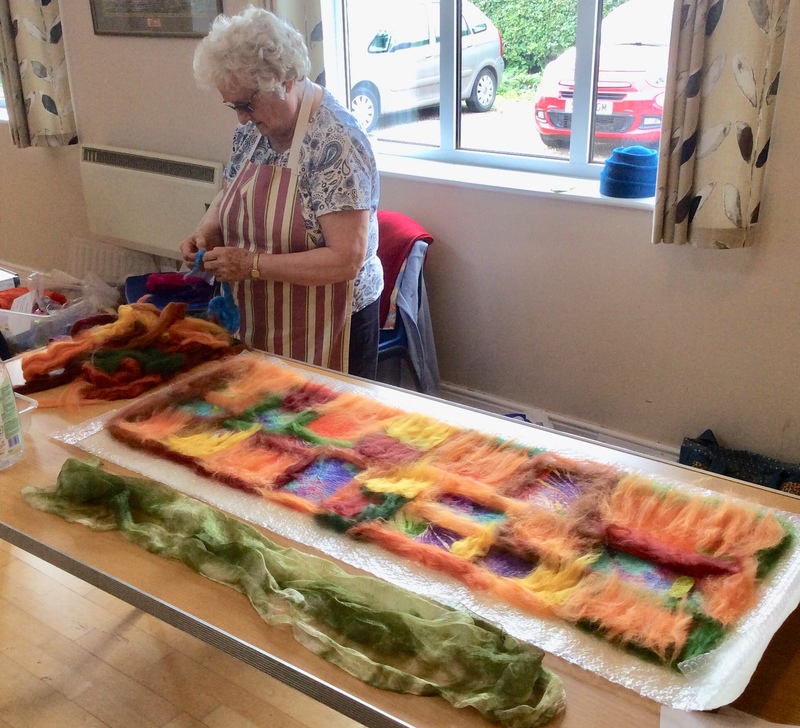 This also means we can accommodate absolute beginners alongside those of you who may have experience of Wet Felting but want to experiment or develope your technique further. On booking you will be sent a (very) short Requirements List of items to bring – nothing that can’t easily be packed for travelling! 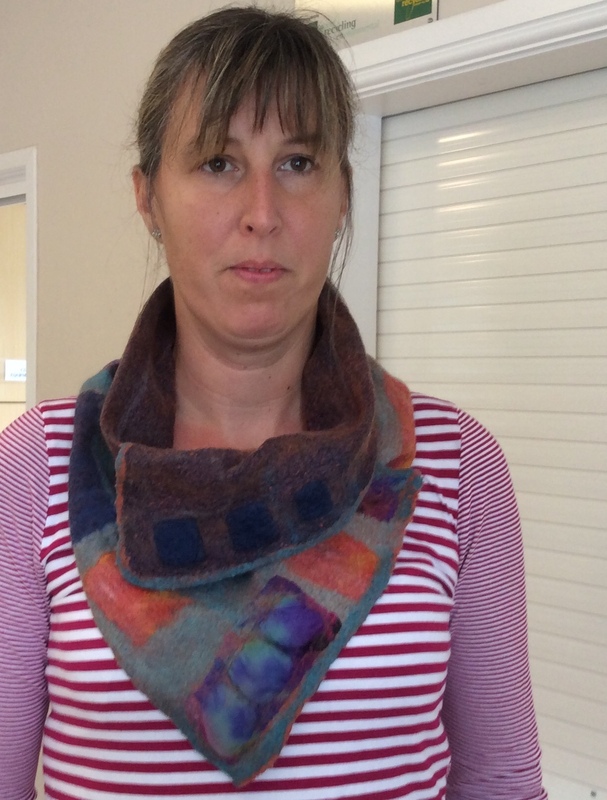 15th – 20th July Nuno Scarf/Collar – In this workshop we will be working with Superfine Merino and silk fabrics, learning the basics of Nuno Felting, to create a beautiful, soft scarf/collar. Each student will work at their own pace and, once finished, you have the option of relaxing or putting your new found skills to practise on another item such as , Necklace or Bracelet. Being both practical and decorative, the beautifully soft, extremely lightweight Necklets bridge the gap between a scarf and a necklace and are ideal for wearing under a jacket on cool evenings. The necklaces and bracelets introduce another technique, differential shrinkage, which allows us to create interesting, undulating surfaces on a flat plane. Once again, each of the additional projects will be totally unique and these can be further embellished with hand embroidery and beads. It’s your retreat…you decide! 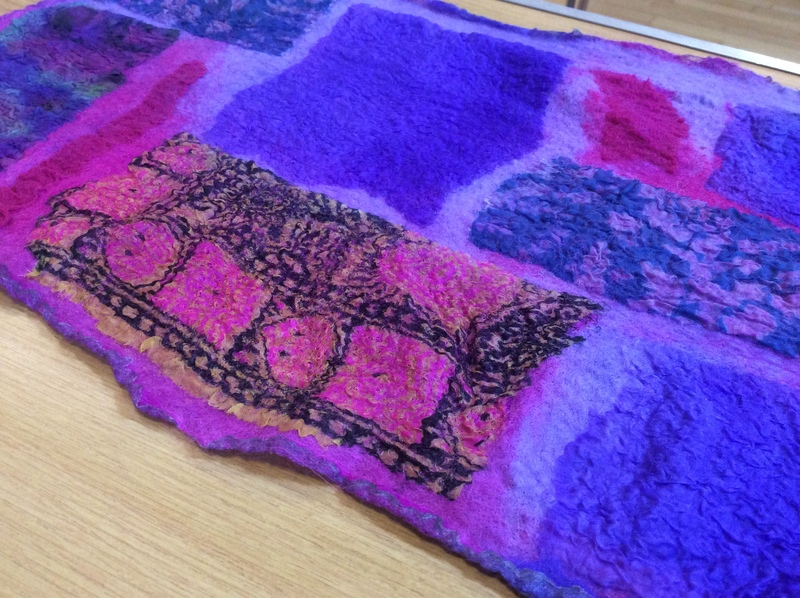 22nd – 27th July Wet Felted Wallhanging – In this workshop we will be covering a variety of techniques including wet felting, needle felting, free motion stitch and hand embroidery to create our own unique wall hanging. It is suitable for any ability from absolute beginner to the more experienced felt maker as well as being a great introduction to free machine embroidery for those who haven’t yet tried it. Using photographs or sketches as our source of inspiration we will begin by designing our layout and colour scheme. There will be examples to look at as we explore the different techniques we might use to create our pictures. 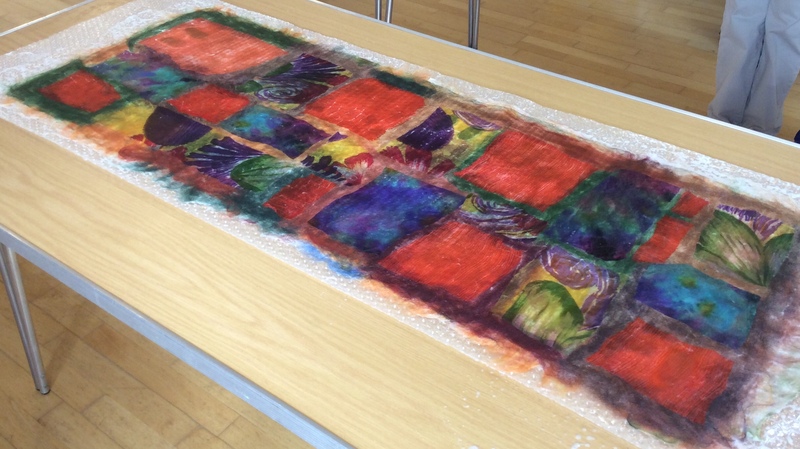 The main body of our work will be wet felted, using loose fibres to “paint” our pictures. 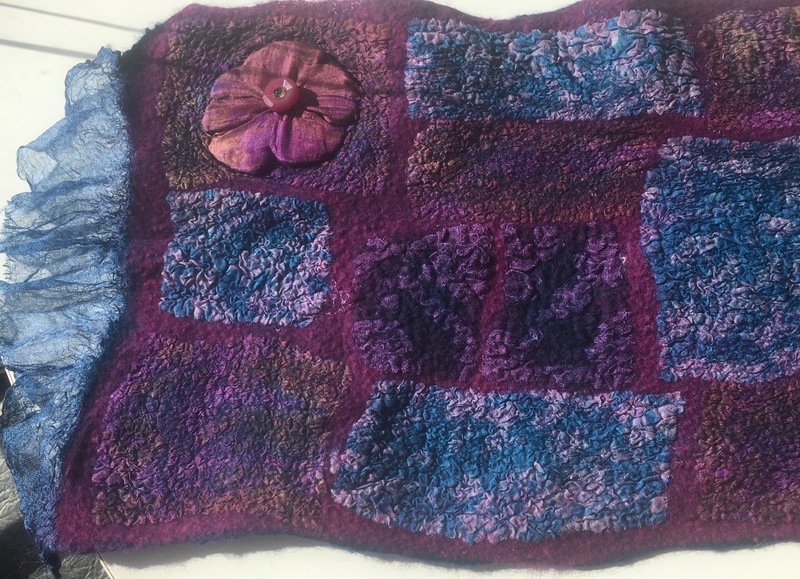 We will also explore the use of our own hand made pre felts, needle felting, hand and machine stitching to add areas of detail. 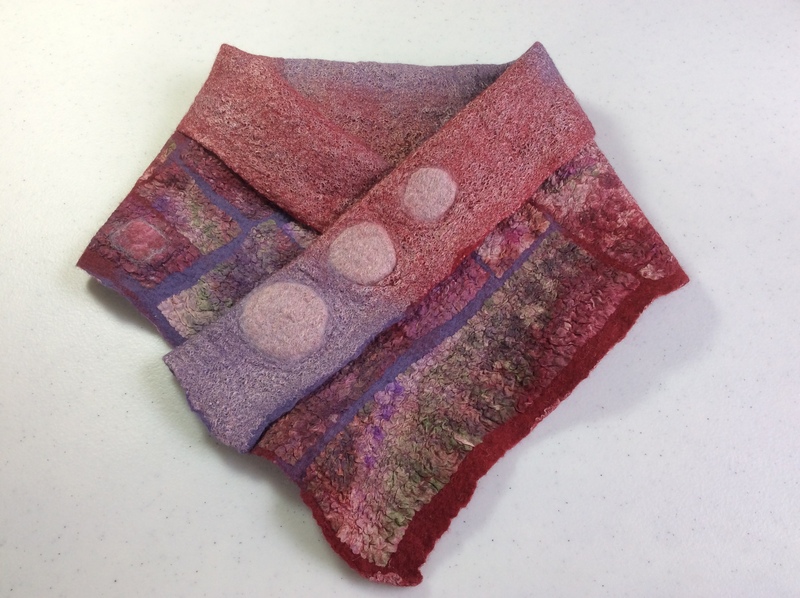 Students can work to any size they wish, working on a large scale and concentrating on the one project, or working to a smaller scale and having the choice of an add-on felting project or simply enjoying more “free” time! If you would like more information about the workshops I will be offering please use the contact form to get in touch. If you have any queries regarding the accommodation or would like to make a booking please do that via the Sweet Nothings Website. 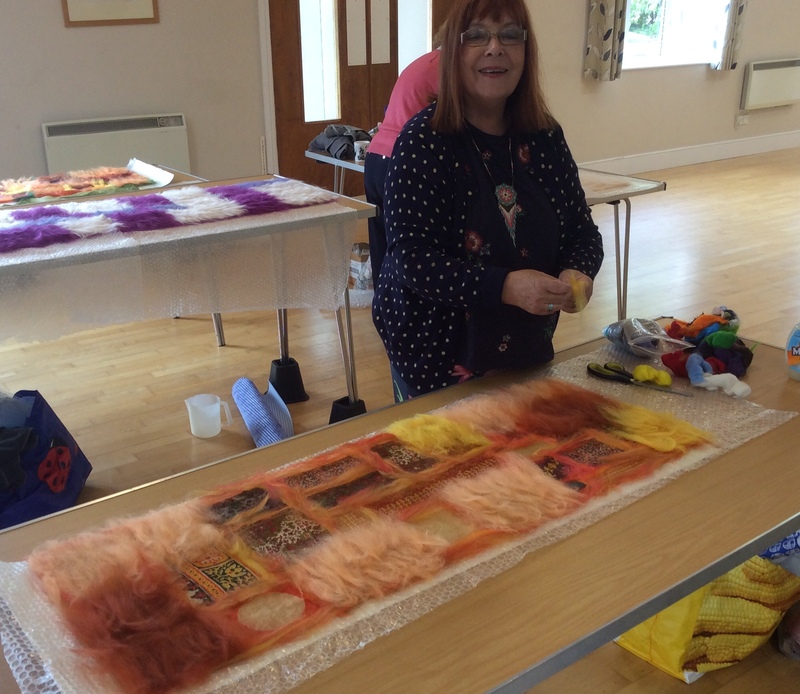 Last week saw eight members of the Belchford Felting Group come together for a Nuno Felted Collar Workshop. Using the “tile” technique we combined superfine Merino fibre with silk fabrics, most of which were bought from local charity shops. 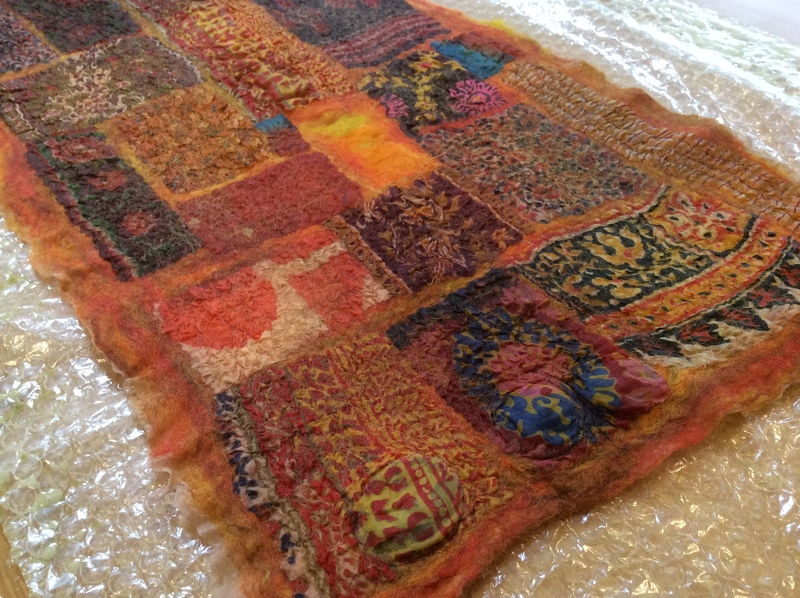 All of our collars were backed with Uzbek silk for a wonderful, soft feel against the skin. 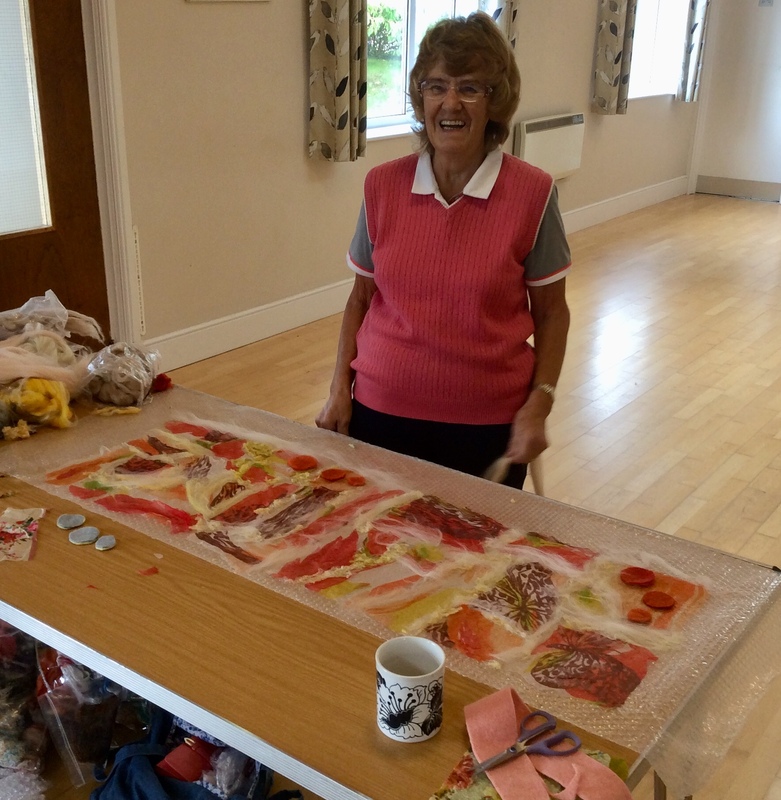 Jacky has her tiles laid out…..
Margaret working with beautiful, bright colours…..
Alison chose a warm, Autumnal colour palette…..
Robyn’s Collar is ready for fulling…..
…..and the finished collar looks great! Everyone did a terrific job and took home something that’s not only unique and beautiful but very practical too!